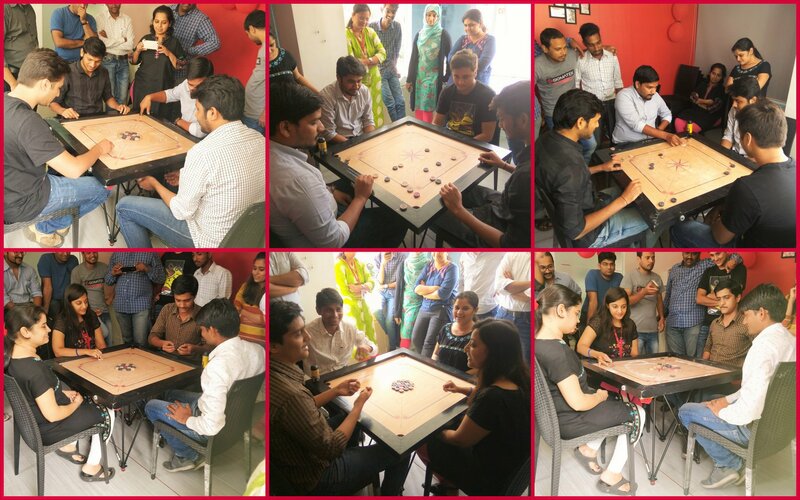 Carrom Tournament - Vaal Triangle Systems Pvt. Ltd. The game of carrom is believed to have originated from the Indian subcontinent. One carrom board with its surface made of glass is still available in one of the palaces in Patiala, India. It became very popular among the masses after World War I. State-level competitions were being held in different States of India during early part of the nineteenth century. Serious carrom tournaments may have begun in Sri Lanka in 1935 but by 1958, both India and Sri Lanka had formed official federations of carrom clubs, sponsoring tournaments and awarding prizes. The objective of play is to use a striker disk with a flick of the finger to make contact with and move lighter object disks called carrom men, which are thus propelled into one of four corner pockets. The striker and carrom men are analogous to the cue ball and object ball in cue sports, respectively. The aim of the game is to pot (pocket) one’s nine carrom men and the queen before the one’s opponent does. The carrom queen is analogous to the 8 ball (black ball) in the game of eight-ball pool. At Vaal we organize this tournament yearly. Employees are teamed randomly. This gives chance of employees from different departments to interact with each other by being team mates. Each and every employee joins to view the matches and try to help their friends’ win the game-mostly by disturbing their opponents 😊-by guiding on strategies to win the game.